The search is on for the next Parenthesis production! Please stay tuned for our announcement of the 2012 Season. 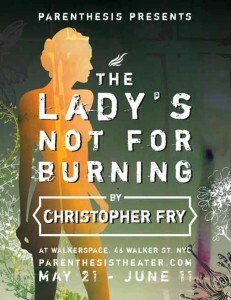 Parenthesis concluded its inaugural production of The Lady’s Not for Burning on June 11, 2011. Thank you to all our patrons and contributors for making it such a successful run!